Waterson was commissioned, along with 14 other established Queensland artists, to respond to iconic Ipswich Houses as part of Ipswich’s 150 Year Celebrations. Waterson’s house portrait of Rhossilli titled Accumulation draws upon her architectural experience, as well as her historical and experiential impressions of the house. In the process of coming to know Rhossilli, Waterson worked through various ways of perceiving its space, light and form. Waterson explains the process of making the artwork began with drawings based on architectural plans and photographs of the house, in which she reduced the front elevation to its essential horizontal and vertical lines. 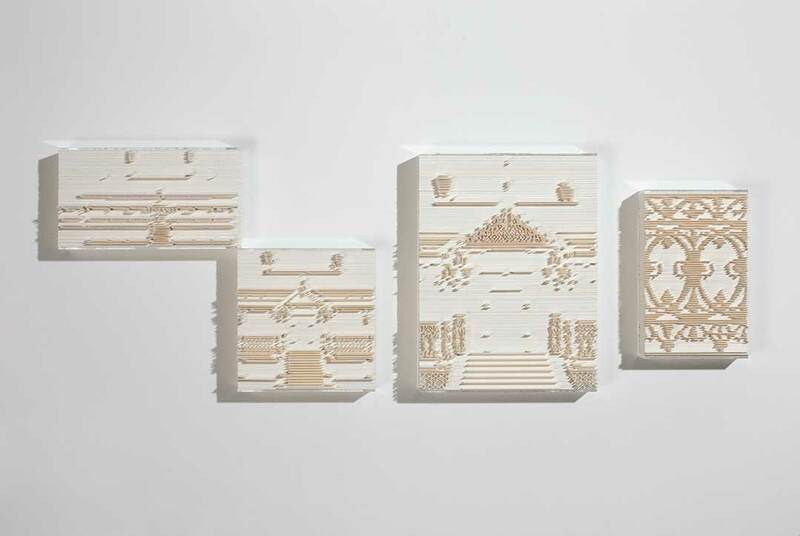 Each single piece of hand-cut paper was meticulously arranged, aligned, and tightly stacked and to holds information that forms part of the original elevations and details of the house. 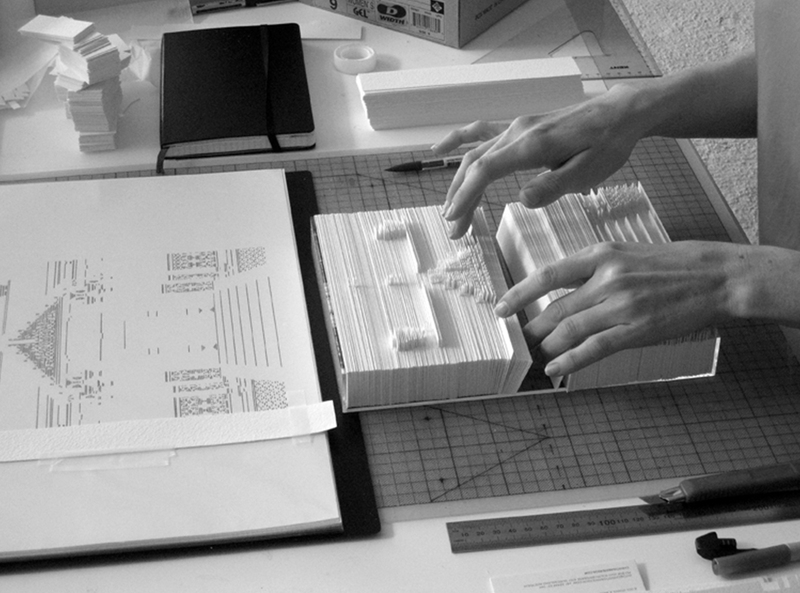 Without each piece stacked against the other, the work is meaningless without the next. 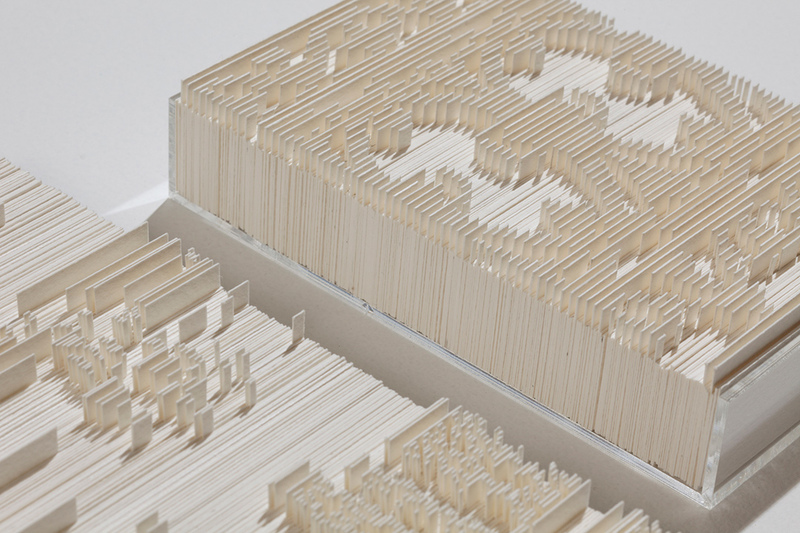 The end result is reminiscent of rotary card files or the mechanical movement from a music box. Intuitively we read the artwork as a set: as we approach the work, the vague form of a house appears like an apparition and in a moment the distinctive form of Rhossilli is revealed. Shift a little to the left or right and the image of Rhossilli is lost. Accumulation (Rhossilli) questions the completeness of memory and threshold of recognition. Via parts; record, accumulated memories, uncovered fragments and stories; the house and its fragile sense of place are re-found.